In a statement last week, the Chinese embassy in Colombo rejected allegations China was involved in a conspiracy to change Sri Lanka‘s leadership, saying it does not believe in such interference. In September, the leader of the Maldives – who had courted Chinese investments – lost an election in a result seen as a setback to Beijing’s ambitions for the islands. “DEBT DIPLOMACY” One of the officials briefed on the cabinet meeting said he was told Sirisena quoted U.S. Vice President Mike Pence’s warning last month that China was using “debt diplomacy” and the Hambantota port in the south could become a Chinese forward military base. 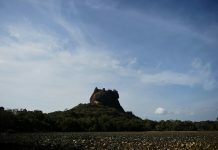 “It wasn’t even an Indian project, Japan was going to be the majority partner with India at 20 percent,” Wickremesinghe said in the interview. But the president not only rejected the proposal but shocked those present by turning on New Delhi, saying he was the target of an assassination plot and suggesting India’s foreign intelligence agency, the Research and Analysis Wing (RAW), was behind it, said officials who attended the meeting.